Inspired from the awesome designs and fascinating engines that distinguish iconic luxury cars, Concord launches a magnificent new iteration of its powerfully masculine 47mm diameter C1 Chronograph in luxurious and rare rose gold with racy black ceramic details. 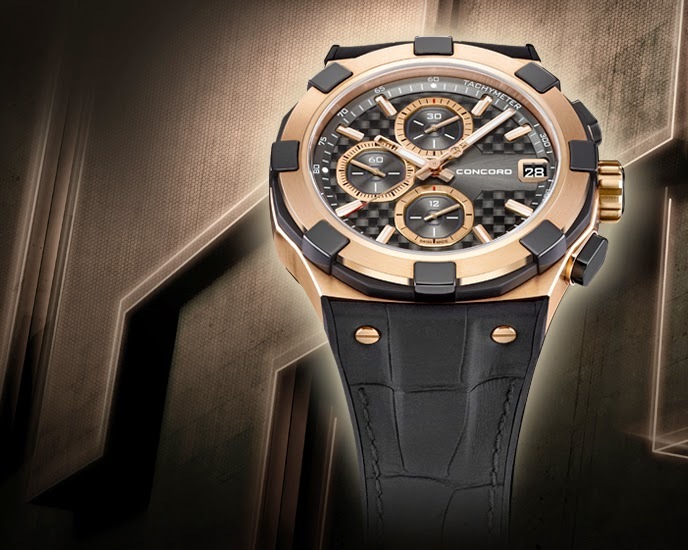 Drawing a proud parallel with the aesthetics and high-tech design of the supreme automobiles from which it takes its inspiration, the C1 Chronograph Gold’s trademark octagonal counters gleam richly from the depths of a dial made of deep black carbon fiber – a material prized in car construction for its lightweight, strong and resilient characteristics. The association is further extended by the black ceramic octagonal sub bezel, dial accents and chronograph pushers which evoke the ceramic brakes on racing cars. A durable, rubberized black alligator strap adds a signature nod to tough rubber tires and the historic circuits on which they perform. Water resistant to 200 meters for those more inclined to aquatic adventures, the new Concord C1 Chronograph Gold guarantees absolute accuracy with three chronograph sub-dials: 60-seconds, 30-minute and 12-hour counters. Hour, minute and sweep seconds functions and date window at 3 o’clock complete a display evocative of gleaming mag wheels and flawless ergonomics. 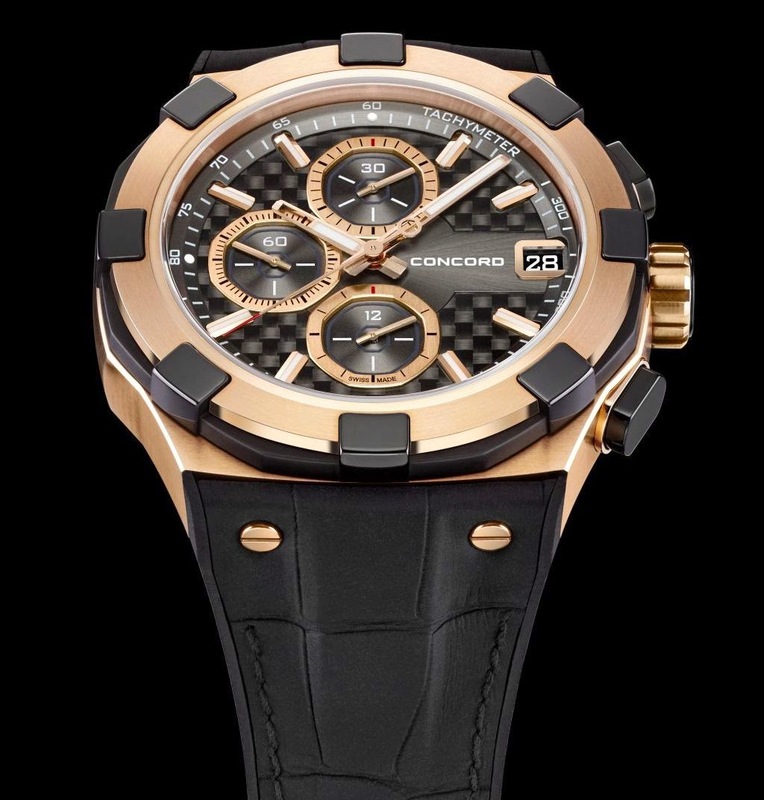 An automatic movement with a 48-hour power reserve in a precious 18K 5N rose gold case powers this dynamic machine that incorporates fine mechanical precision with high-end materials, strong, aggressive design and cutting edge technology.